Ask The Bellwether: Meme: Nice Matters: Nice Tips! Meme: Nice Matters: Nice Tips! Leigh recently gifted me with this lovely award! "This award is for those bloggers who are nice people; good blog friends and those who inspire good feelings and inspiration. Also for those who are a positive influence on our blogging world. Once you’ve been awarded, please pass it on to 7 others who you feel are deserving of this award." Wow! I am very glad to be reaching blog-folk with the things I have to say, and very impressed that Leigh felt it worthy of this. 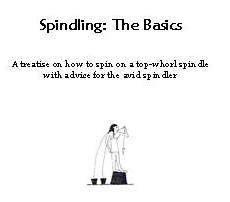 I got to pat myself on the back recently for a milestone at The Bellwether, too -- Spindling: The Basics has now sold 600 copies! WOOT! For my "seven", I'd like to point you to the seven most recent entires in my SpinTips feed - the list has seven more, times ten! These are blog entries or websites that taught me something fiber-licious, inspired me, or made me smile! stoneleafmoon's Tutorial on spinning "dirt yarn" possibly the most thorough post I've seen on making an art yarn. I aspire to be so thorough on the blog! Connie Delaney's Anasazi spinning: a great small Navajo-style spindle, the Hohokum, on which cotton is spun, and the "real" Navajo plying. It's great that Ms. Delaney shares her spindling knowledge here! Fiber Fool's Color and Design thread -- yep, I joined her meme too! Twosheep on Production Spinning: how to oomph your spinning speed! Crafty Diversion's Homemade Yarn Swift ... I love DIY tools for spinning! Jacquie Grant's NZAK sock machine how-tos on YouTube ... this is terrific! makes me want another one :-) Jacquie runs sockknittingmachinefriends, and has always been quick to respond to emails and given me great advice! The making of modern Mali spindle whorls ... it's terrific that this website shares the process. Goes to show that this company really gets its product. Cool! Now, not all of these are blogs, so they can't all carry the meme forward; but I hope you enjoy them as much as I do -- if so, subscribe to SpinTips to keep up with my findings, and let me know if you find a great website for me to add!